This zesty summer salad is the perfect side to any meal! It is simple, light, flavorful and delicious. The key to this recipe is sweet, juicy tomatoes! Prepare the vegetables by washing thoroughly and cutting them into larger bite size pieces. Combine them into a large bowl. If you like extra crunchy broccoli, use the broccoli raw. 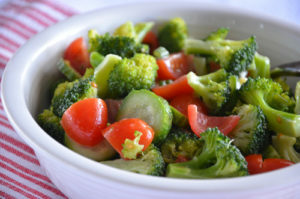 If you like it to be softer, blanch* the broccoli in water for 3 minutes, rinse with cold water and then add to the bowl. After the vegetables are ready, drizzle the Rogliano's Authentic Italian Dressing on top (mix a little bit of the Rosso Italian Dressing in too if you like a kick!). Stir the dressing in gently, and season with salt and pepper if you like! This salad can be served immediately, but should be stored in the refrigerator. Enjoy! Bring a pot of water to a boil. Place 1- 1½ inch broccoli florets in the boiling water for 3 minutes. Pull the broccoli florets out of the boiling water and place into a bowl of ice water to stop the cooking process. Broccoli should be bright green and firm (but soft) when done.